Chinese legends tell of a kind of infallible sacred sword, forged from meteorite material, that gave its bearer an apparently supernatural advantage over his opponents. 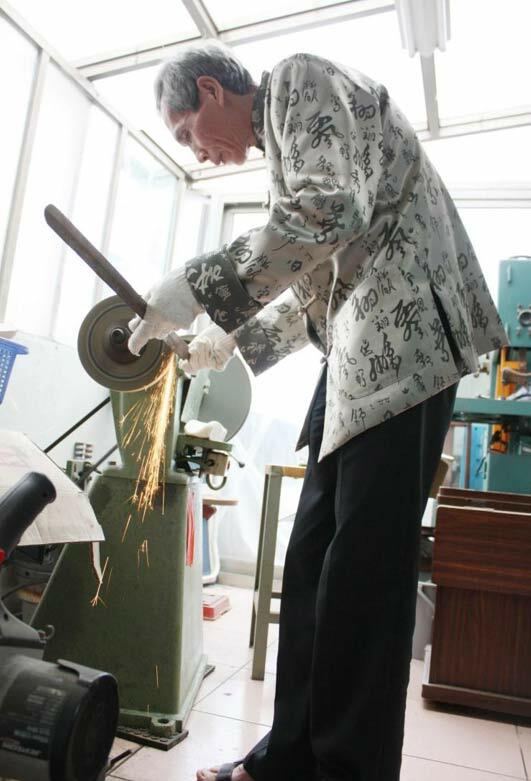 The creation of such a sword seems beyond the capabilities of ancient technology, but modern sword-maker Chen Shih-Tsung has revived the art successfully—guided, he says, by instructions imparted to him by celestial beings. While Chen Shih-Tsung sits on the couch of his apartment in the south of Taipei, tens of thousands of dollars of high-alloy steel sit on the wooden racks behind him, each one his own creation. He’s the only person on the planet who makes swords like that. Chen is famous in the Chinese-speaking martial arts world. Growing up on martial arts novels, the Chinese equivalent of knight errantry, he slowly developed the wish to become a real-live sword maker. It took eight years and an enormous sum of money for Chen to realize his dream. 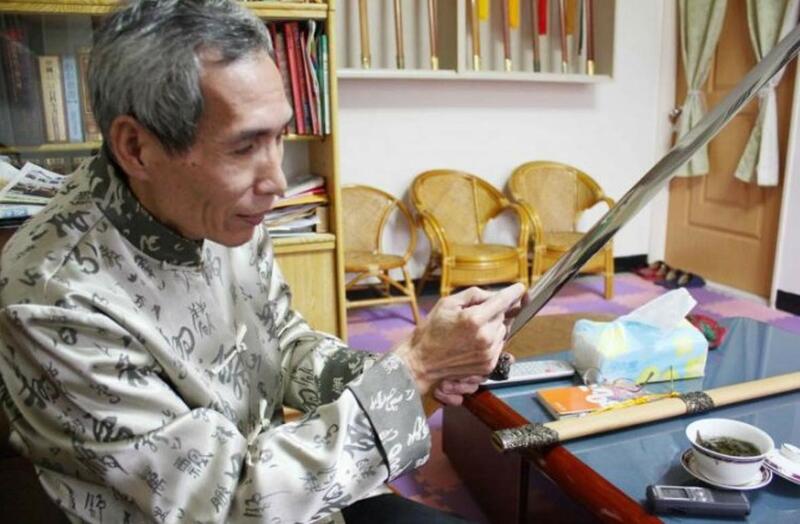 He is the first person in modern times to recreate the kind of swords that are thought to have been used in ancient China, and is now passing the art to his sons. At over 60 years old, tall, lanky, and animated, Chen sits on the edge of his couch, gesticulating and explaining his life spent pursuing the legends passed down through martial arts novels. Chen spent long years working at a used car dealership, quietly amassing a fortune. At the same time he was reading voraciously and travelling extensively in search of the swordsman’s tradition. Legends speak of buried manuals detailing the construction of infallible sacred swords. Going throughout Taiwan and then China, he found nothing too specific; the communists burned many of the books documenting such traditions during the Cultural Revolution. Nevertheless, he learned much generally, and as the years went by, he slowly began experimenting with sword-making himself. Listening to Chen’s story is like entering one of the martial novels he used to read. At some point during his travels he discovered that ancient swords were all smelted from meteorites—doing so now is impossible, since not enough fall as thousands of years ago, and modern man doesn’t know how the ancients turned them into swords anyway. He also says the swords he makes are imbued with special powers, and that he was first taught how to make them from celestial beings who visited him in his dreams. The first entry in the book he wrote is, “Words from the Purple Hermit of Hao Yuan Celestial School.” The Purple Hermit regards the process of casting swords as one that can “startle the universe and move the gods.” Only masters can unlock the magic powers hidden within them, the Hermit writes. Before he succeeded with his first sword, Chen had an extremely vivid dream. Lights, deities, and celestial beings unfolded before his eyes in a display of brilliance. They communicated with him wordlessly, showing him how to make the swords. That wasn’t to be the first time he had such visions, either. Deities have appeared by his side and given him instruction while he was in his workshop. But he is reticent to describe the scenes further; most modern people won’t believe it, he said. Unlike the swordsmiths of feudal China, Chen’s output is considerable. He’ll usually make ten swords in one go, because while one is cooling he’ll move to the next. When the steel of one blade gets too hot from the grinding wheel, he’ll move on to the next blade. It takes a special combination of high-quality steels to make the swords that Chen needs. They need to be extremely strong—at least 58, but up to 65 on the Rockwell Hard Scale. The Rockwell Hard Scale is a common way of measuring the hardness of metals, developed in the United States in the early 20th century. A regular chisel or axe may be between 40 to 45, which gives an idea of how hard Chen’s swords are. They can split rocks in half. The prohibitive cost of raw materials and producing the bars are some of the factors that make Chen the only caster of such swords. Other swordsmiths may make their works by manually heating materials and then hammering them into shape, either by hand or with the help of a machine. They grind them later, but swords made through this method are no match for what Chen produces. It’s related to the composition of the material. It took Chen eight years to stumble across the formula for his swords, and he hasn’t modified it since. The sword needs to be both extremely strong and highly flexible (during the interview Chen pulled a sword from the rack and flexed it past 60°). Those that can be manually heated in open flame and then bashed into shape aren’t as strong as Chen’s, forged as they are in the high-tech furnace of a modern steel factory. In making the swords, one’s heart has to be incredibly calm, Chen explained. He sits in meditation for an hour before starting a grinding session. Casting swords of this kind has an irreplaceable human and spiritual element. One of the most labor-intensive steps in the process is grinding steel bars the blades with the help of a spinning grinder. The grinding is all done at his shack in the countryside. Like an artist running on pure inspiration, he’ll work for 20 hours straight, only stopping for food, water, and toilet. At that point everything relies on “hand feeling,” something which can only be achieved through experience. The entire process also needs to be completed in one go. Once the feeling is lost, the craftsman will never be able to get it back. Grinding the steel bars into swords requires incredible precision. If the spine isn’t exactly in the centre, or not exactly straight, if one of the edges is cut too deeply, the work is ruined. Heat can also imperil the blade. Grinding a piece of metal on a spinning stone makes it very hot, and heat causes steel to expand; if the bar expands too much it will deform and be useless. The human element is essential here too, because there’s no formula for dealing with thermal expansion in sword making. It relies on skills and experience, which take years to develop. Grinding the sword is only half the story, though. Once a sword is ground, polished, and given a handle and scabbard, another process begins. This is what transforms a valuable sword into an invaluable one. Each day the swordsmith needs to rub the sword with a cloth. This generates heat, and the molecular structure of the steel changes when it becomes hot after wiping. Two to three years of wiping every day and the structure of the steel becomes stable. Blue rays start to deflect off the surface. At that time, the sword will never rust again, and further maintenance is no longer needed. The only way to get rid of the pores is to rub the steel until it gets hot, forcing the slight amount of aluminum in it to melt. Since aluminum has a low melting point, it will come to the surface and melt, blocking the pores. It takes years to fully achieve this. Chen is in the process of teaching his sons how to grind swords, and it sits on their shoulders to carry on the tradition. The article ‘ Swordmaker, Instructed in Dreams, Recreates Infallible Sacred Swords of Legend’ was originally published on The Epoch Times and has been republished with permission. But what I have found is that sometimes it was nature that actually caused it and Man discovered things like this by accident like “Bog Iron”. I can’t find it now, but I saw a similar method that was found by accident and used to make fairly fine quality High Carbon Steel. Dry Peat Moss has always been used as a fuel and it was discovered that some of this Peat Moss was naturally very high in Iron and other Alloy Ore content. What they would do is start and keep adding Peat Moss to a Bloomery like the one in the above link. But as the Coals died down in cycles, they would take a fairly heavy wooden tree limb and pound down into the Bloomery from the top similar to a mortar and pestle. This would do two things, It would act like forging and bring the Bloom together into a homogenous billet and also force an additional carbon content to the bloom. Then they would repeat with adding more Iron and natural added Alloy rich Peat Moss and do again until they had a fairly workable size Billet of actual natural High Carbon Steel Alloy. This was the secret of the Scots that gave the Romans such a fit. But it was found by accident and I think many more events like this happened throughout history! "... seems beyond the capabilities of ancient technology." These words need to be erased from human vocabulary. The more we learn about "ancient technology",, the more absurd that phrase becomes. How do you know that the cloth was not a muslim cloth on a grinding wheel. And another thing to test out. Grinding does get vey hot. a good experiment, grind something for ten minutes straight and see if you can still carry that peice without gloves. Or better yet lay it out on a cotton shirt. Friction, the idea is to get out the grinding marks to make a clean surface without holes. The author goes to great length to wax poetic about absolute nonsense. Cast metal is always inferior to forged and all the mumbo-jumbo and spiritual visitations in the world won't change that, Then rubbing will melt the lower temperature aluminum in the steel and seal the pores? Really? Even a few minutes with Wikipedia will tell you that corrosion is caused by electrolytic action between areas of differing ionic potential in the metal. Some folks are just plain gullible.